It didn't get the hype of Windows 95 (which is probably a good thing), but Microsoft's latest version of its Windows PC operating system is a good step forward. And just as Windows 95 ushered in a new look and feel for the OS, Vista also changes much of the appearance and functionality of the system. Is that a good thing? I think so. I like the new look for the most part. It's attractive and colorful, yet, with the taskbar and start menu still holed up in their traditional places, the desktop is close enough to the original Windows 95 (and iterations since then) look that the learning curve won't be too onerous. I've been using Vista Ultimate for about two months now, and I like the new interface enough that I haven't switched back to the "classic" view – which I did about ten minutes after installing Windows XP. I even like the Windows Sidebar, which offers you a clock, slide show thumbnails, RSS reader and little yellow "post-it notes-compatible" on one side of the screen. That surprised me; when I initially installed Vista, I figured the slide show in particular would rub me the wrong way, as well as being a resource hog. I still don't know about how much of the system's resources it uses, but have discovered that I love that having little slide show at my mouse's beck and call. I set the slide show to flip through my folders of family and pet pictures, which lets me keep my favorite pics handy without framed photos littering the real estate that is my real desktop – that big, flat fake wood area the keyboard, monitor, speakers and a whole bunch of junk sits upon. And the virtual post it notes are wonderful for jotting down a phone number, date, or whatever other quick reminder I might need without requiring me to open Outlook or its ilk. Vista's new look extends to how you navigate your computer, too, adding drop down menus to each "level" in the path to a particular folder. To speed up navigation, you can click on one of these menus and get quick access to the tree from that point; it's faster than going up or down the tree endlessly, folder by folder as you had to do with earlier Windows. All isn't sweetness and light, however. I've still experienced my share of software hang-ups, though I don't think they're generally as serious as with XP et al – and to be fair XP was pretty stable. And there've been software compatibility issues. For example, my copy of Dragon NaturallySpeaking 9 refused to even install on the Vista system (which was probably better than wasting my time by installing and then refusing to run). And Vista refuses to open zipped files, which is a real pain in the buttocks. Other applications have brought up warnings about possible incompatibles as well, but so far they've all run with no apparent problems. Vista really doesn't like my Linux network, either. When we installed the OS it refused to acknowledge the network that XP and NT had handled beautifully; it took my computer professional son to go "under the hood" and poke around until he forced Vista, kicking and screaming, to acknowledge the network. The network is where I keep the files that would be in "My Documents" if I kept them on the local system, but Vista hasn't let me simply move the place where it sees "My Docs" to the network like XP did. So now shortcuts, on my desktop and other places, pointing to the folder on the network. It isn't a huge deal, but it's something that XP did better, and that makes it noteworthy. Then there's the security. Microsoft has taken a kicking over the years for security holes, and it appears to want Vista to not have that problem. Highly understandable. I don't know how successful they've been at filling the holes, but the new security settings are a real pain in the neck at times. Every time I try to load software that lives on the network drive (Portable Mozilla, for example), I have to click through a "Are you sure?" thingy that wears thin very quickly. Not only that, but it refused to run my Portable Thunderbird from the network regardless of how I pouted and cussed. I had to copy it to the local drive before it would work, even though Portable Mozilla, which was in a neighboring folder, works fine once you click through the damn "are you sure?" popup. Vista's Start Menu has been rearranged as well. Where before you had a cascading series of menus, the new look groups functions and/or tasks such as documents, pictures, music, network, "connect to", control panel and the like along the right hand edge, with the programs themselves on the left. In some ways I liked the old way better, but I think that might just be the curmudgeon in me. Oh, yeah: my Windows Vista installation's "help and support" system doesn't work. If I click on it (it's tucked in the start menu) a window comes up and the help function seems to head into cyberspace, then comes to a screeching stop and gives me the message that no help is available. There's also the issue of hardware requirements. While pretty well any PC sold these days should run Vista fine, my system didn't meet the minimum requirements for Vista Ultimate (including a gig of RAM) so I had to upgrade the PC to review the OS. Okay, it was past time to do that anyway, but it was still a pain being forced into it. We ended up building a whole new PC and it has worked just fine with Vista. 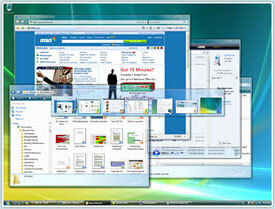 Vista is very media savvy, with built in support for TV/DVD, audio and the like and it's integrated well. This is good, since PC's and the home theater are, if not married, at least engaged. There haven't been a lot of obvious bugs other than the Help issue, and Vista does seem to work as advertised, at least from a "generic user" perspective. IT pros in the corporate environment may find issues, but I've been quite happy with the overall experience. And don't forget the inevitable bug fixes and upgrades that will undoubtedly come. Vista has already updated itself many times since I installed it, mostly to update its built in firewall (Windows Defender) definitions. My bottom line, after about two months using Vista, is that it's better than XP (which was the best Windows before Vista), but most of the improvements are cosmetic or convenience-oriented rather than really important stuff. Nothing wrong with that; Windows now works well, generally, so why mess with it? 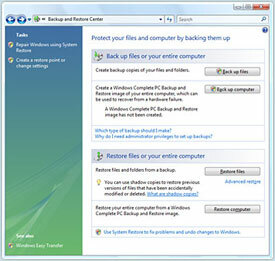 Microsoft Windows Vista comes in a variety of editions, all of which have different hardware requirements, so you're best to check out the box of the edition you're contemplating to ensure your system is robust enough to handle it. Is Vista worth your money? That's a tough one. If I were upgrading my PC or buying a new one I'd definitely get Vista or have it installed. But I'm not sure I'd run out to the store to get Vista just to install it on a PC that's already running Windows XP well. If you’re unfortunate enough to be running an older version of Windows, especially ME or 95, I'd definitely run out and pick up Vista, though chances are your PC is also old enough that you'll need to start from scratch with your hardware, too – in which case a new PC with Vista bundled is probably the way to go. Update, April 9, 2007 - my DVD ROM drive ceased working over the past few days and neither cussing nor crawling to my son and begging for his expertise has corrected this problem. Upon digging into the system, my son concludes that Vista may have downloaded an update that have have changed the driver. Hopefully, a new update (or maybe a "downdate") will be pending that will correct this situation. Update April 12, 2007 - We got the drive working again last night, as well as a USB-based drive that was also refusing to work. There was a conflict of some sort with iTunes, which had installed, apparently, with Quicktime, so we dumped iTunes from the system and Windows suddenly deigned to acknowledge the drives..
Update April 10, 2007 - reader Jan in Washington State writes: "I note that you apparently have not tried to play high-definition ("premium") media such as HD-DVD or Blu-Ray, which is what is Vista supposed to do better than any other operating system. Very briefly, it does NOT work and your Vista machine will NOT play them in HD because this content is protected by DRM and there are no DRM compliant drivers yet. All you get is a reduced quality picture and sound. You cannot write your own drivers because Vista will NOT load any DRM driver that has not been certified. It goes so far that if you make your own PowerPoint presentation in HD, Vista will play it in low resolution because you do not have a DRM certificate for it. (Otherwise you could import HD contents into PowerPoint and bypass DRM...). In short, Microsoft is more concerned about DRM than about their users."